Concluding this extensive study of God's great Grace it seemed good to once again reveal just how secure we are in Christ. In this study, we've seen how Grace is greater than all sin, missteps, failures, and guilt. Today, let's examine how great His Grace is in guaranteeing our salvation. Some may object saying, "I've heard that before." "I know I'm secure." My response is you know you're secure now. Sometime in the future when you blow it or mess up, or just plain sin you may not feel so secure. It is good to deposit the Word in your heart so it is already there to counter the lies of the enemy. If you just browse a bookstore it is rare to find much on the subject of the eternal nature of our redemption. It is especially rare, if not highly unlikely, to find a book detailing our eternal security in Christ in a Charismatic/Pentecostal friendly bookstore. This is why the Lord keeps pressing this beautiful Gospel truth for all to receive. Freedom to the religious tradition ruled mind appears like wickedness and lasciviousness. Removing the shackles of Law and traditional rules and regulations appears to some as giving people a license to sin. "What will keep our people in line?" these leaders ask. My response to that is to give people the Word of God. Reveal the Finished Work to the Church. Reveal their perfect acceptance and righteousness in Christ. Show God's people that as He is so are they in this World. Expound the glorious details of the New Covenant. How much more fruit would believers bear if they were taught they were already holy and sanctified because of what Jesus did? Is our Salvation a guarantee? If we say yes, religion cries foul. They say this produces licentiousness among Christians. If we say no, we create loopholes in God's great Grace. These loopholes are just the right size to allow Law, legalism, and works to dilute Grace and pollute the Gospel message. Is salvation a guarantee? 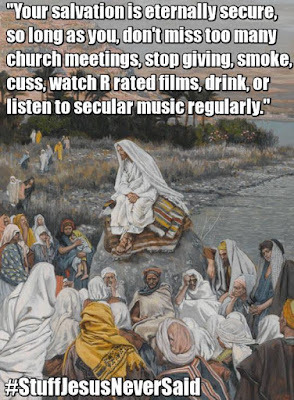 What say you, Jesus? Jesus, says it's a guarantee. What about the Apostle Paul? The Apostle Paul and the Lord Jesus Christ both concur. Our salvation is secure, it is a guarantee. His great Grace has procured a perfect redemption. God's salvation is a guarantee. If we could lose our salvation, what is Jesus going to do with our dwelling in His Father's house? If our salvation is not a guarantee, then we are merely renters of our Heavenly dwelling. God must have eviction notices ready in hand in case we miss it once too often. Think of it. If our salvation is not completely secure then where is the comfort of Heaven? If it isn't guaranteed then is Jesus even preparing a place for us? Does He wait until we take our last breath and then breathes a sigh of relief saying "you made it"? Does He then commission work to begin on our Heavenly dwelling? If He has already prepared this dwelling, does He tear it down each time we blow it? Does He rebuild our dwelling when we "repent" and say we're sorry? Thank God He does none of these things. I am so glad to say we have a Heavenly dwelling awaiting us. Jesus purchased this dwelling place by His shed Blood and Finished Work. We are owners, not mere renters. Once we're in Christ, there is no more fear. There is no insecurity. There will be no "eviction notices" for us in Heaven. In summation, His great Grace has provided a completely free and eternally secure redemption. This salvation is not a probationary period. This salvation is a guarantee. We are not just renting space in Heaven until we can work hard enough to finally purchase a permanent Heavenly dwelling. In Christ, we are forever forgiven, freely made righteous, accepted and eternally secure. And it's all because of Jesus and His shed Blood and Finished Work.